So Much Star Wars News! Disney held their annual super-expo the other day, and among other awesome things, they revealed a ton of new Star Wars news! Being a big Star Wars fan, that seemed like a pretty swell thing to me. First up, they released this awesome new poster for The Force Awakens, by artist Drew Struzan, who drew famous posters for the other movies! 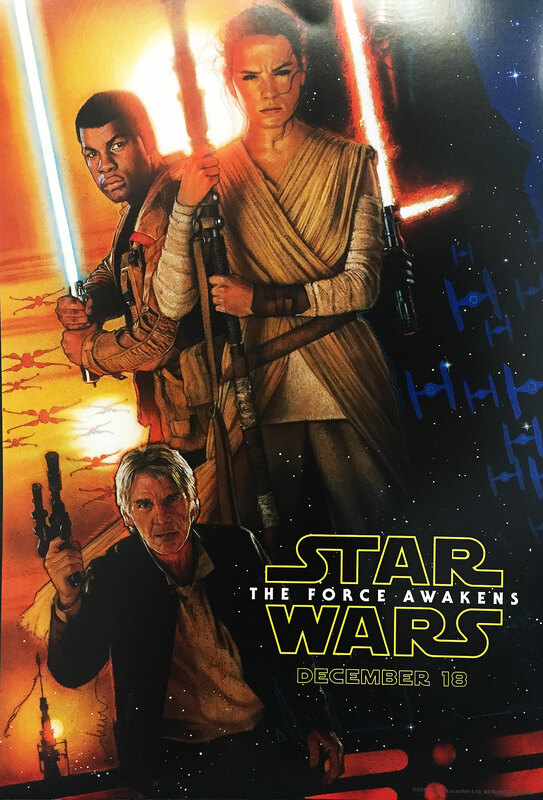 So wait, the stormtrooper guy from the trailer now has a lightsaber? So much for my Stormtrooper Jedi fan-fic! As for the other news? 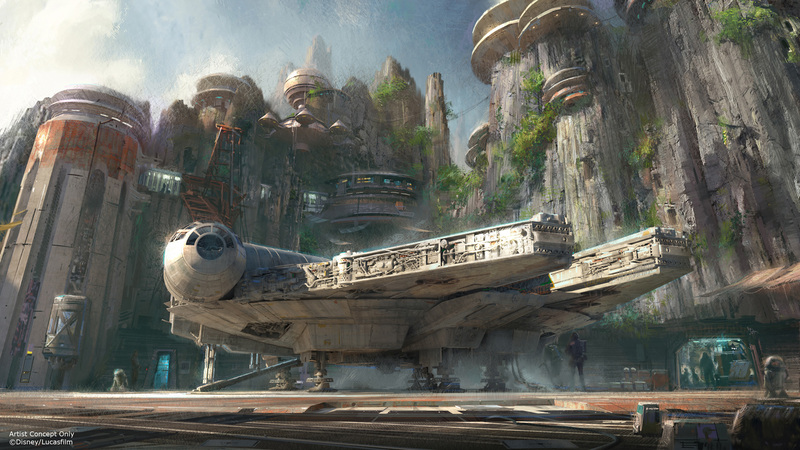 Disney has decided to build new Star Wars-themed additions to their theme parks! Both Disney World is Florida and Disneyland in California will be getting giant additions, multiple acres worth. People are calling them the biggest ever additions at Disney parks! These new additions will involve a new alien world, full of lush greenery, Star Wars-style buildings, and probably a 50s era diner populated by aliens and droids. Amiright? There’s also going to be a ride based on the Millennium Falcon, and if this picture is to be believed, maybe a full-sized replica? That would be amazing! My family are huge Disney fans. I’ve been to Disney World three times in my life, and I have fine memories of each time. 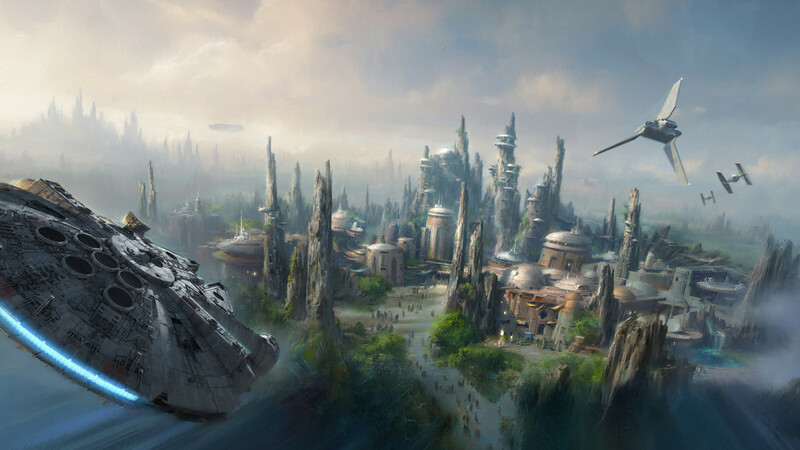 We’re definitely going to have to make plans to visit this new Star Wars park when it’s done. Maybe my parents will have grandchildren by then! Posted on August 17, 2015, in Star Wars and tagged Disney, Disney World, Star Wars Episode VII, Star Wars: The Force Awakens. Bookmark the permalink. Leave a comment.